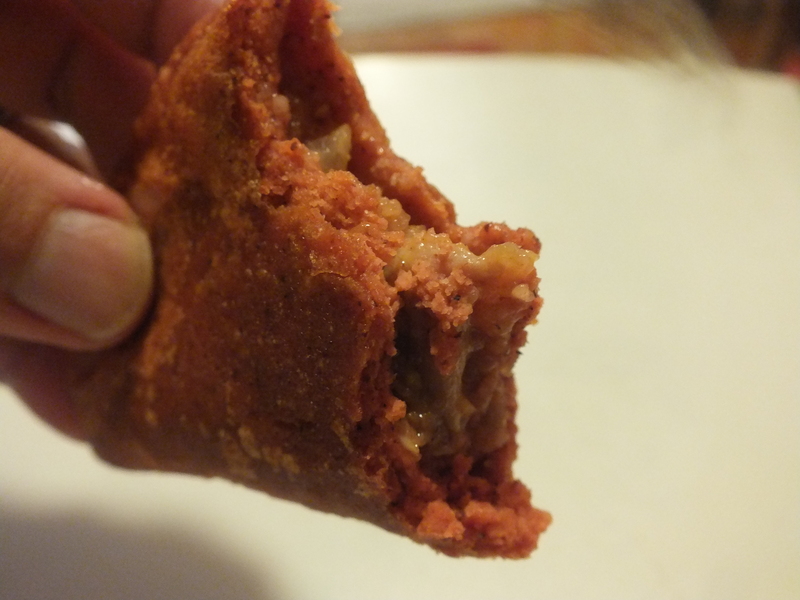 This is the empanada I grew up with. Not that I ate a great many of them; I probably have only eaten 10 of these in my life. And I’ve never made them. Until now! 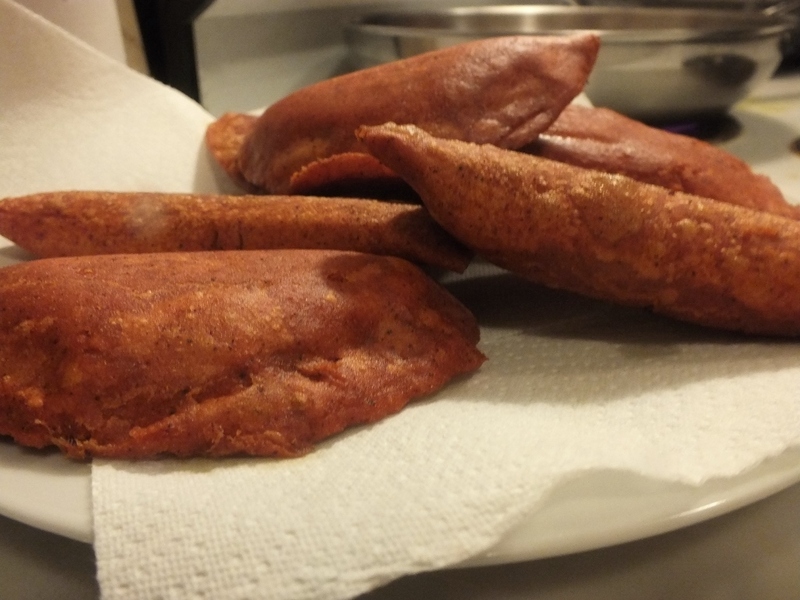 Empanadas from Columbia are the only other empanadas outside of Guam, that I’m aware of, that use seeds from the achiote plant to color the dough. The filling for the Columbian empanada, however, is different. I believe they use potato, or pork, or beef, whereas the filling for the Guamanian version is a mix of chicken and rice, onions, and garlic, and is also colored and flavored with achiote. In tropical areas, people use seeds from the achiote plant to color the water that they then cook with to both stain and flavor the food, usually meats. This is where annatto food coloring comes from. One of the few things that I remember fondly was how intensely the seeds from the plant stained my hands as my mother showed us how to make red rice, using seeds taken directly from pods of the plant in our backyard. Actually, I think it was from my neighbors plant that grew over to our side. Thanks, neighbor! I loved the scent of the seeds that lingered on my hands afterwards. It’s a slightly distinct bitter smell and taste that is easily tempered by salt. I tried to describe it to someone yesterday, but couldn’t adequately describe the taste. As a powder, it looks a lot like cayenne pepper or paprika, but it doesn’t taste like either of them. It’s used quite a bit in Yucatecan food (food dishes from the Yucatán Peninsula, in Mexico). 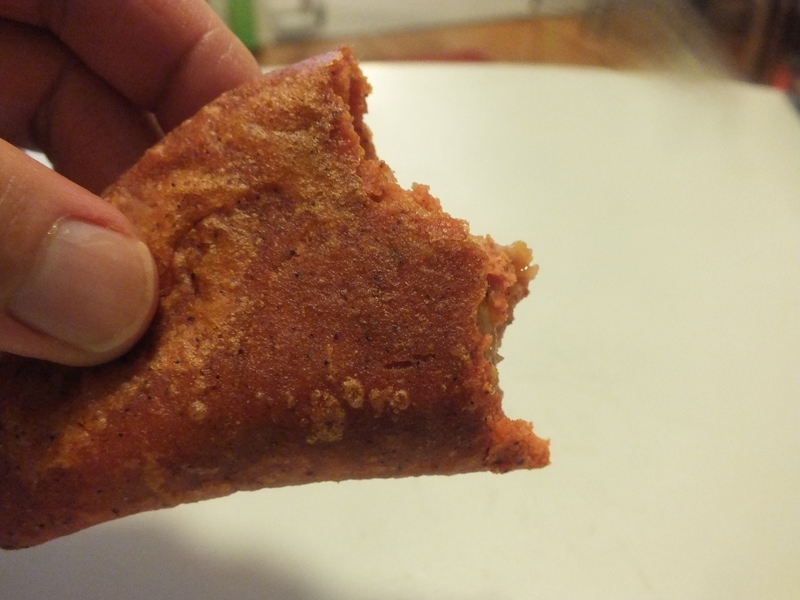 I used this recipe, and followed it almost exactly, except that since the recipe didn’t call for a specific amount or brand of achiote powder, I didn’t know how much to use. I used 3.5 ounce box, or 100 grams, of achiote paste from a company called El Yucateco. This, or other brands can easily be found in the Mexican or “Hispanic” aisle of most grocery stores. 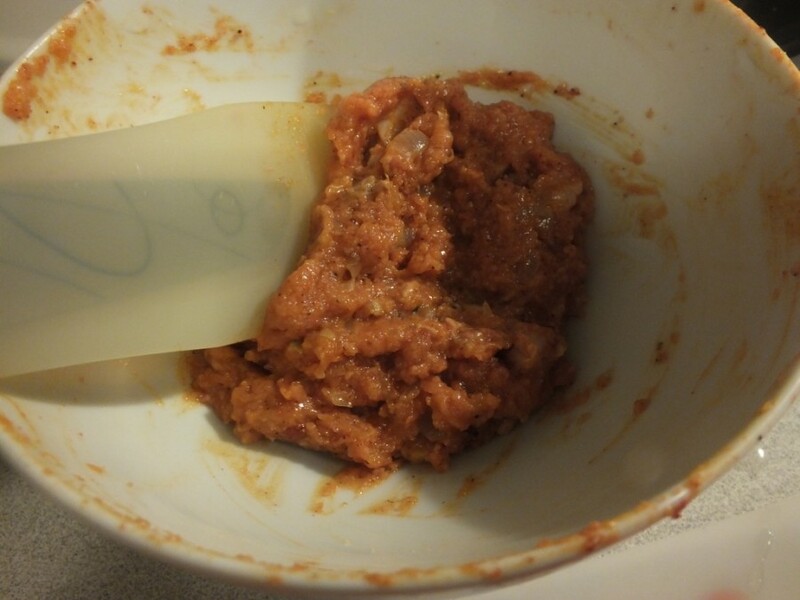 I used about 1 ounce of it for the filling, and the rest of it (2.5 ounces) for the dough. I also added almost twice as much chicken in the filling, thinking that it wasn’t going to be enough. Sure enough, I had extra filling, which I ate like a side dish for another meal! You’ll want to make the filling first, so that when you make the dough, you can fill them quickly after forming them. When you make the dough, you also want to make sure it isn’t too dry, so depending on how you measure your masa harina, the amount of water or chicken broth you use to wet the masa harina to turn it into a pliable dough may vary. You want the dough to be soft and pliable; not too wet that it’s sticky, but not too dry that it starts cracking or falling apart. Saute onions and garlic in a large pot. Cook until onion becomes transparent. Add the chicken meat and saute for about 2 minutes. Add chicken broth or water. *if you use water you’ll have to season it with salt (to taste). Bring to a boil. Using a whisk, gradually add the cream of rice. Keep stirring so that there are no lumps. Bring heat to medium and cook for about 3-4 minutes. Add hot pepper (as hot as you want it) and then remove from heat. Completely cool before filling the shells. Mix masa harina, corn starch, salt and achiote powder in a bowl. Add oil and broth or water to the flour mixture. After adding 1 1/2 of the broth or water, slowly add the last 1/4 cup, but only if needed. If you accidentally added too much liquid, you can always add a little more masa harina, but be careful. Knead with hands until dough is pliable. 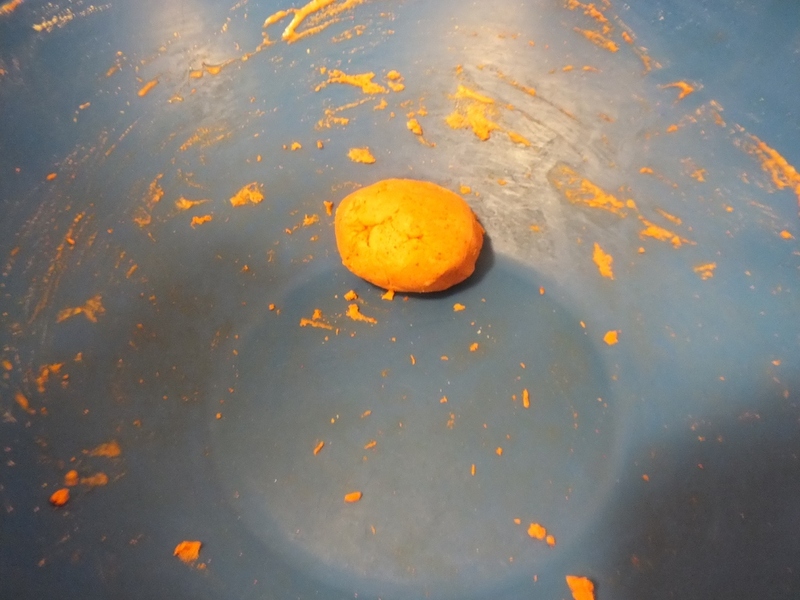 Roll or press dough into 1 inch balls. (I used larger balls, about the size of golf balls, and didn’t press it as thin as I could’ve, so I made less than the 2 dozen.) 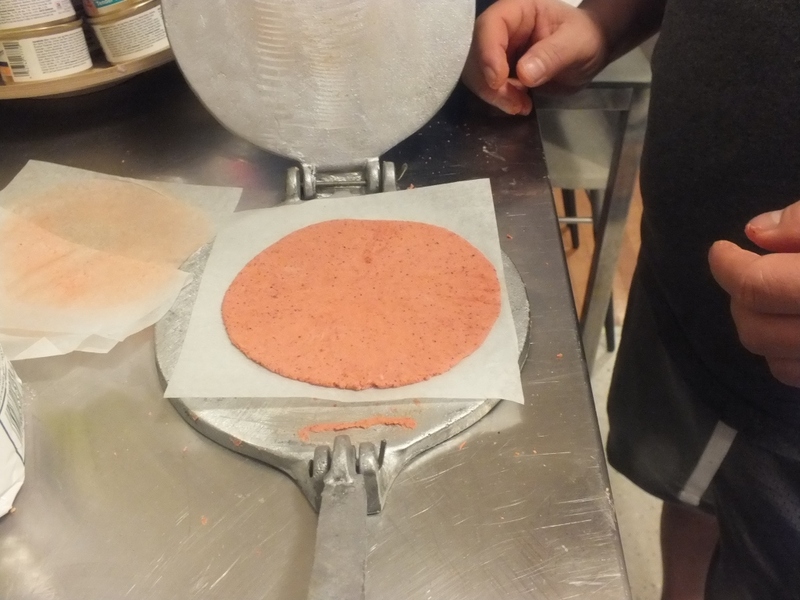 Use a tortilla press to flatten to form a circle. Be sure that you press the dough between 2 sheets of wax paper. Fill the bottom half of the circle with the cooled filling. Fold over the top of the dough to meet the bottom and press to seal the edges. Deep fry until nice and crispy. This recipe makes about 2 dozen. I made them about golf-ball size. A tortilla press is handy, but you can also use a rolling pin. 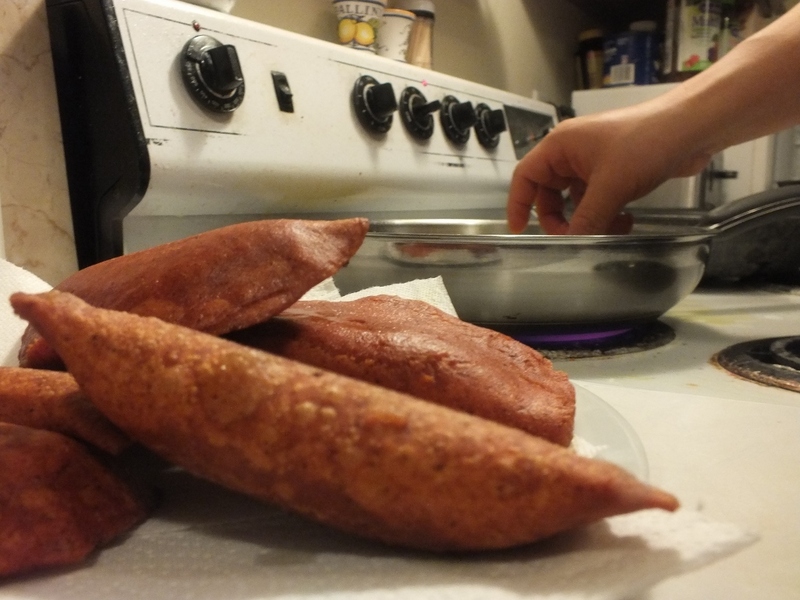 getting creative with flipping the empanadas. For a really thorough video using a similar recipe, look here. This entry was posted in chamorro, chamorro food, empanadas, Guam, island food and tagged achiote, chamorro, Chamorro food, chicken, empanadas, fried, Guam, island food, rice, yucatecan. Bookmark the permalink. Ok. Here ya go. LOL Seriously, I gotta make more of them. I was kind of worried that I wouldn’t be able to replicate them as well as I remember them to be, so I didn’t make a lot of them. Now I wish I made more. I don’t think there is any place in Washington state that makes or sells these. Happy New Year! I love them. Can’t have them all the time, but once in a while is good. Thanks! I have seen this recipe on a website featuring recipes from Guam, http://www.671guamrecipes.com. Looks like you copied it word for word and didn’t even give the person credit for using her recipe. Do you think this is right? The owner of this recipe has posted pictures of empanada and the recipe on the Facebook Page “671 Recipes”. There is even proof that this recipe is hers. Maybe you should give credit where credit is due. Hello Burnt Sienna, and thanks for commenting! I am very sorry for the misunderstanding, but on paragraph 7 of My post, I link directly to the website that you mention and said that I have used the recipe from the source you stated and did it almost exactly. I should have changed the language somewhat, so for that I am sorry and so I have just re-edited the language to reflect what I have done more closely and took away language that the original author of the recipe used. By linking to the website that you mentioned, I consider that to be “giving credit to where credit is due”, and have never tried to pass this recipe off as something that I’ve created. I hope this is an improvement, and again, sorry for the misunderstanding. Si Yu’us Ma’ase! and Peace! You’re welcome. I really did not intend to copy the recipe word for word, so thanks for pointing that out. I could totally understand how that looked. You are right to call that out, and I would not like that if someone did that with my posts. I have further edited the post so that it gives credit to the original recipe more clearly. Have a great day! That’s right in general there’s only one original enpanada recipe in the Pacific Islands, the basic recipe n it’s totally up to u how u want to make it. Whether u like it tasty n flavorful into ur own desirable taste n satisfaction. U know it if it’s the original mixed because u mixed it right! Cooking is challenging. No recipe is perfect because we all have a different taste. The bottom line its so yummy! Thanks for stopping by and commenting. You can cook however you want. I’ glad you are proud of where you’re from, and nobody is telling you you have to cook by measuring things. So have a good day. Wow! These look amazing and make me miss home. I know! Me too. I seriously considered making some lumpia, red rice, kelaguen, and latiya as well. Have my own little fiesta! Hahaha! Then take the first plane to Guam and hang out at Ypao. But then again, seeing the destruction of coconut trees by the invasive species, the rhino beetle, would depress me too much. I welcome Burnt Sienna because she was right. When I started this blog, I did copy and paste here and there, and it helped me not do that anymore. So, it’s all good. About the press, it’s just a normal sized press, I believe it was from a latino grocery store. Peace and Love to you! Thanks for stopping by! That is a cool thing you are doing, I’m sure the Alexandria House appreciates you very much. And thanks for the encouraging words. Have a good holiday and peace out! Hi Dave! It’s great to know that you’re part of our heritage & the Chamoru food brings joy to you when you cook them. People – food – love – fellowship! So I really wanted to know, did your empanada crust get soggy a few minutes after frying them? 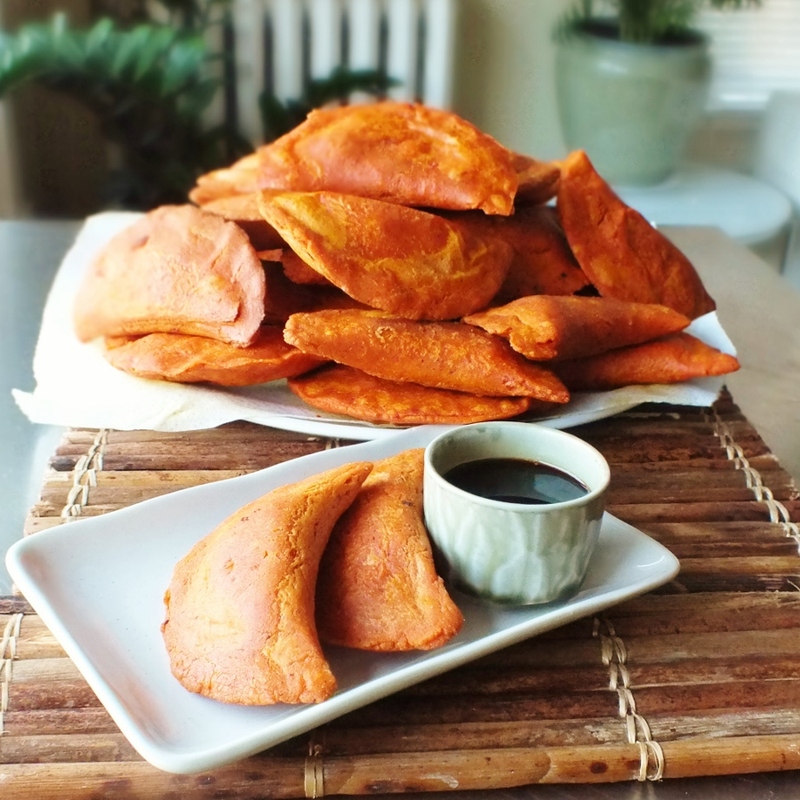 I am from the south of the island & the empanadas I’ve eaten back home were no where near soft/soggy or even flaky until late afternoon or next day. 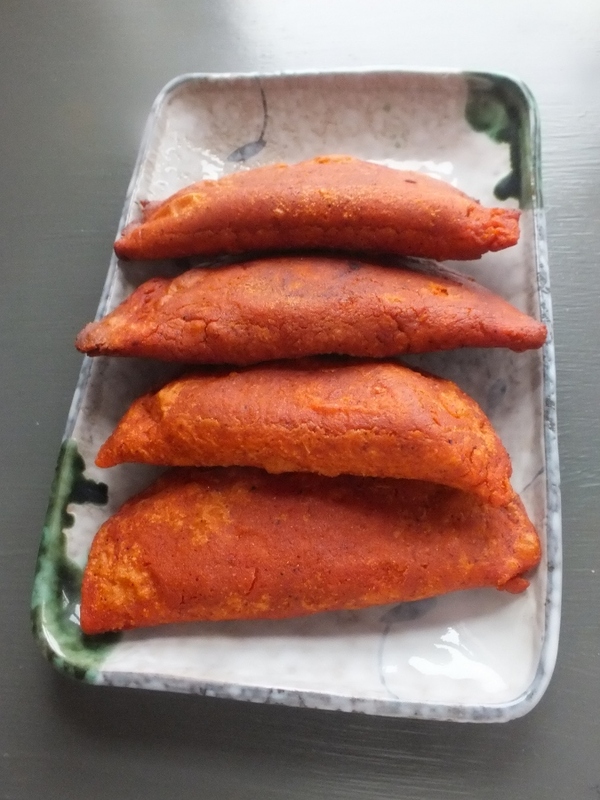 I’ve tried many variation crust recipe since being here in the mainland & come to find that it all softened minutes right after frying & it’s a no go for me …I am on my quest to find that one perfect empanada recipe that’s as crispy as I know it to be from Agat Oriental store 😀 take care & appreciate all you do! Hello! 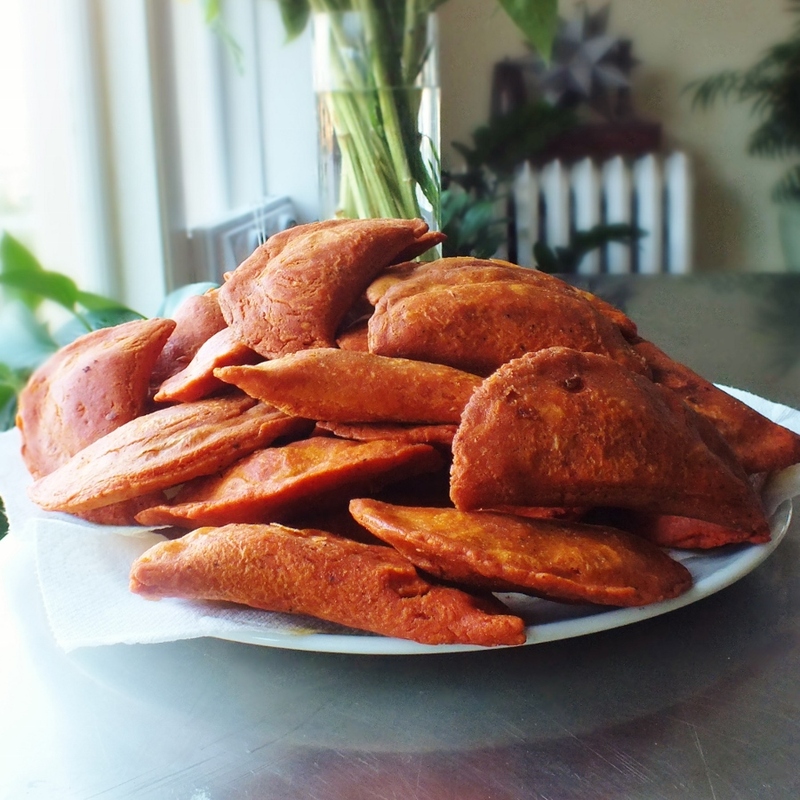 Growing up I never made these, but always enjoyed this type of empanada that others would make. I would say, try refrying them if they get soggy. Also, I use peanut oil whenever I want something crispier. Peanut oil tends to make things crisp, plus doesn’t really have a detectable flavor. As far as these, I wouldn’t say they were as crispy, but they didn’t seem soggy. When I warmed them up in the toaster, they seemed fine. Hope that helps. Happy 4th! Oh, I almost forgot! Sometimes when you fry something, it can be soggy if the temperature isn’t hot enough. 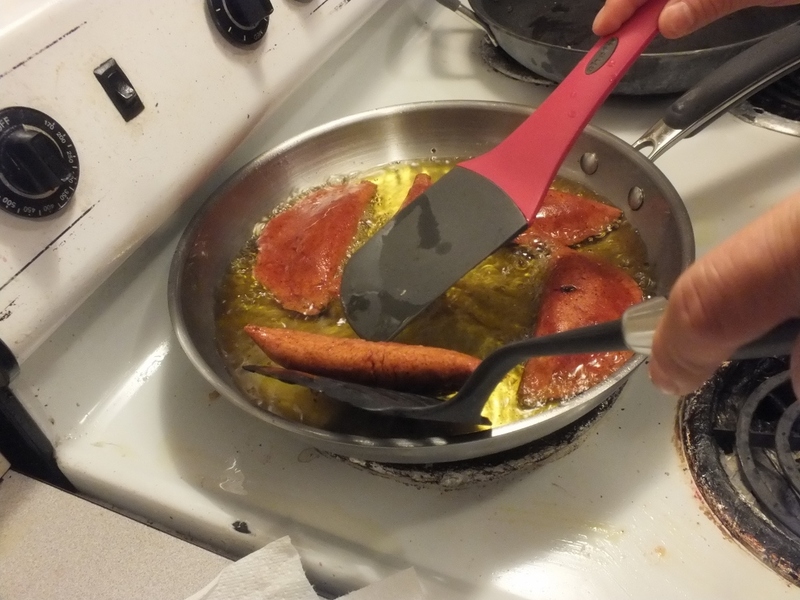 So before you start frying, test the heated oil by pinching off a small amount of the filling and throw it to the oil. If it starts bubbling furiously, then it’s hot enough. 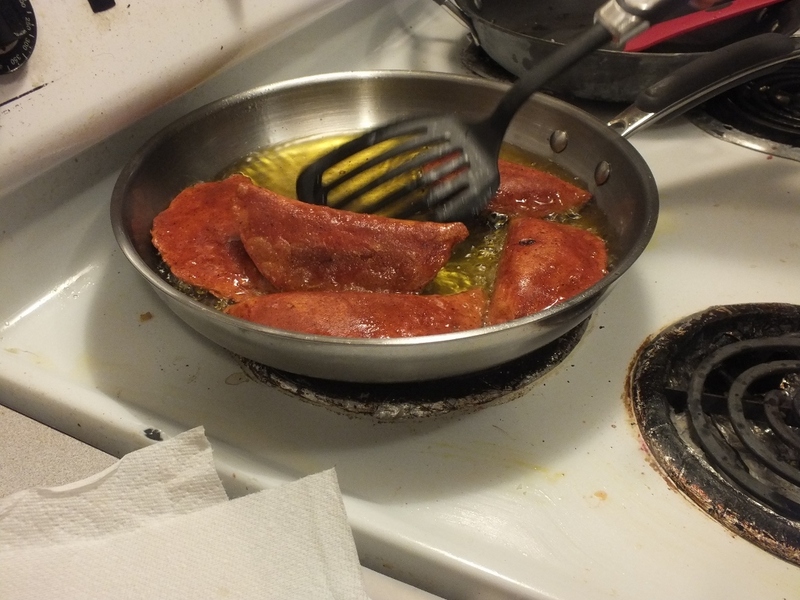 You want to make sure the oil is hot enough, otherwise your finished product will be soggy. Thanks for stopping by!! 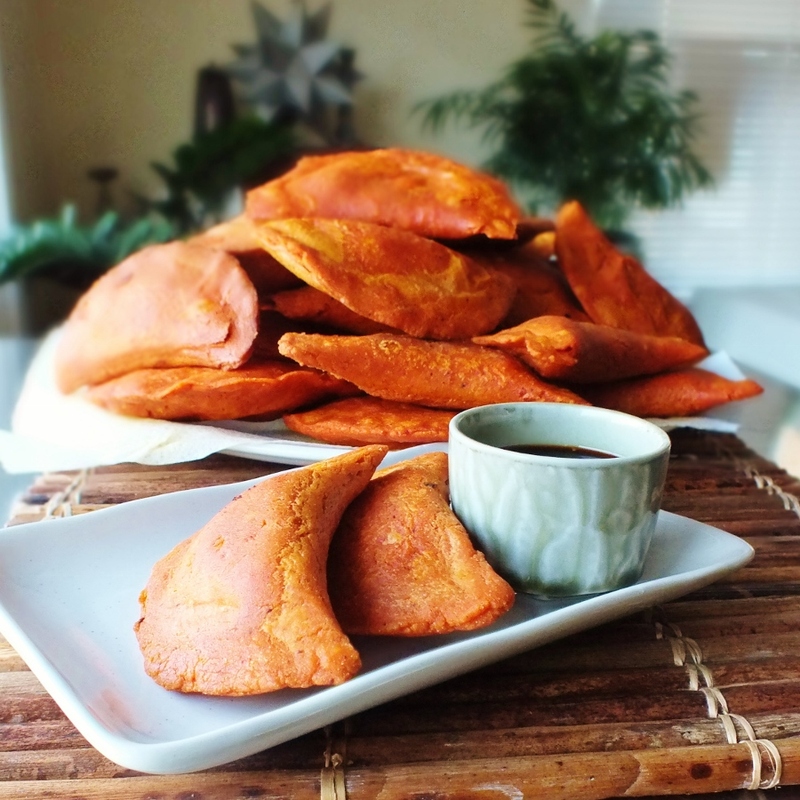 In Belize (located in Central America) they also use achiote to give the masa that beautiful color to the empanadas!